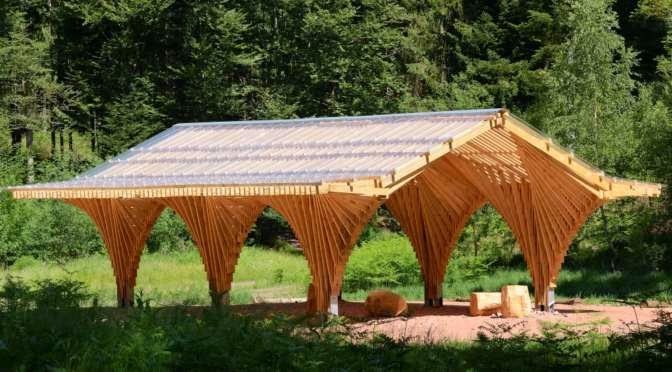 A FOREST SHELTER BY STUDIOLADA AND YOANN SAEHR ARCHITECT Archi-new - Free Dwg file Blocks Cad autocad architecture. Archi-new 3D Dwg - Free Dwg file Blocks Cad autocad architecture. Special features of the operation: The refuge of the bog is a participatory construction work which companies participated, executed by the means at hand. It was built by a team of municipal employees and volunteers of the village. It will provide accommodation for walkers and children "Green Class" school trip to come every week to discover the treasures of the last of peat in the area of Meurthe-et-Moselle. The small covered terrace raises the question of small sections of wood and the issue of density in architecture. The shape frame wave, massive, light, is in the clearing like a bug. It offers a new and fascinating use of the "good old wooden board." Everyone can make their own interpretation of the building according to your imagination - the frame, bathed in light, seems like a cloud. The structure consists only of old planks bolted together to form a thick band that allows uniform tension within the distribution. Beams and columns are regular and aligned, but the position of the beam is moved progressively neck - to support various constraints or triangulation cantilever beam. This particular arrangement also creates arcs and crosses that serve as reinforcement for the three major building plans: lateral, longitudinal and ceiling. Crossbucks or no reinforcement panels are needed. Lateral expansion is allowed (up to 20 inches of linear expansion between summer and winter) because there is nothing to prevent: cross straps to allow movement and corrugated Plexiglas is extendable like an accordion. Source Studiolada Architects.